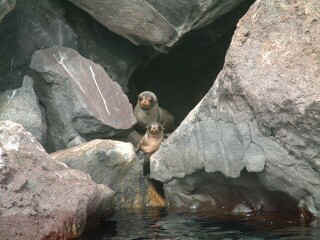 This section highlights the fauna (animals) of The Galapagos Islands. Anyone visiting the Galapagos Islands (or anywhere with such diverse and interesting wildlife) should carry reference materials with which to learn more about what they're seeing. In our case, we used Wildlife of the Galapagos by Fitter, Fitter & Hosking for our animal identification. It's a good general wildlife identification book which includes birds, insects, marine and land mammals and reptiles. 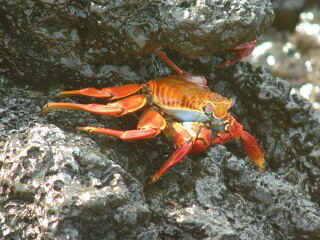 Sally Lightfoot Crabs decorate the black volcanic rocks with their brilliant orange and scarlet colors. At 20 cm (8 inches) wide, they are easily seen from long distances. We love their Latin name graspus graspus. As scavengers, it's a name they deserve, given that they grab at anything they find, and of course, they need to grab hold of the rocks very well in the surging ocean. The Galapagos Marine Iguana is the world's only sea-going iguana. Believed to be descended from green land iguanas of Central America (they would have arrived on plant rafts carried by the ocean currents) they now feed exclusively in the water, almost entirely on algae. They hang out in the sun on rocks, beaches and cliffs to warm up after foraging for food in the cold ocean. There are 7 sub species on different islands, and they vary in length from 78‑150 cm (31‑60 inches). 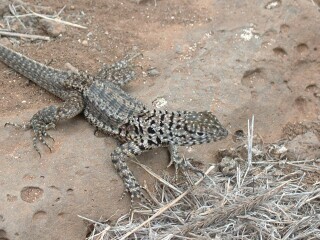 Most of the ones we saw (and stepped over and around) were about 0.5‑1 meter (20‑40 inches) long. 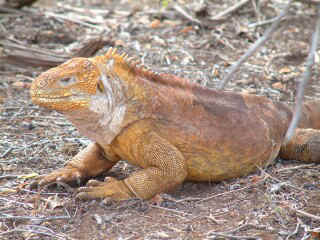 The Galapagos Land Iguana (of which there are 2 species) grow to 1 meter in length, and live up to 60 years. Apparently, when Charles Darwin visited the islands in 1835 he had trouble pitching his tent due to all the iguana holes! The current population is somewhere between 5,000 and 10,000 animals. Young iguanas eat insects and spiders, but as they mature they become vegetarian, feeding mainly on the pads and fruit of the opuntia (a kind of prickly pear) cactus. 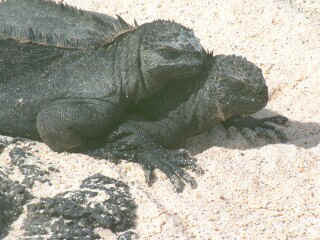 There are fewer land iguanas than Marine iguanas, probably due to predation by feral pigs, dogs and cats. Although we'd only seen photos of Lava Lizards before we arrived in the Galapagos we always thought they were big, like the iguanas, but in fact they range in length from about 8‑10 inches (20‑25 cm). They are everywhere -- on walls, paths, rocks, sand, trail markers. There are 7 species in the islands, but we saw only the two which inhabit San Cristóbal, Santa Cruz and Isabela. Their main predators are hawks, snakes, herons, centipedes and mockingbirds. The females have a very bright orange or red throat. They are definitely more skittish than the iguanas, and harder to photograph. White beaches on volcanic islands? Why not black? 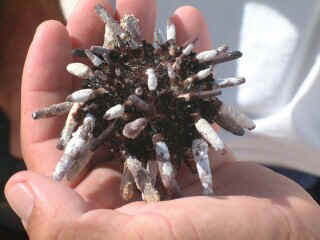 The Pencil-spined Sea Urchin can be thanked for the white sand beaches found throughout the islands, despite the black volcanic rock that forms most of the land. These urchins (along with the Parrot Fish) ingest the small white corals growing offshore, and excrete white "sand" which is washed ashore. 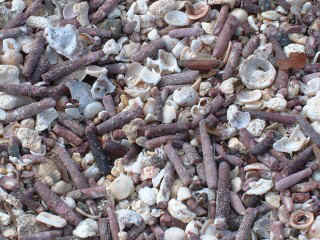 Also, the spines of these urchins (which are not sharp) make up much of the beaches themselves. Looking down through the clear, cold waters of the Galapagos we were thrilled to see a large school of sting rays swimming just below the surface. 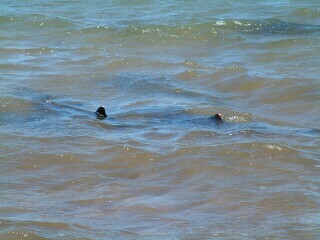 When we jumped in (in our wet suits) to snorkel, some swam away, but others ignored us. These Spotted Eagle Rays often jump from the water and land with a huge splash. 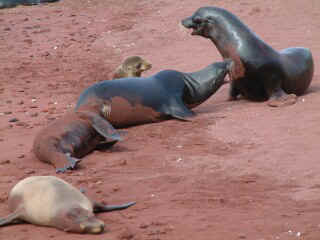 The Galapagos Sea Lions (a subspecies of the California Sea Lion, but smaller) are the largest land animals in the Galapagos and are present on most of the beaches. They have no fear of people, but the males can be aggressive towards not only other contenders for the title "beach-master", but also towards humans who walk or swim too near their beach. The pups, which are born after a 9 month gestation, are nursed for 5 or more months, then begin eating the normal diet of fish. The pups are restricted to playing on the beach and in shallow water, herded by the beach-master who barks his displeasure in no uncertain terms. 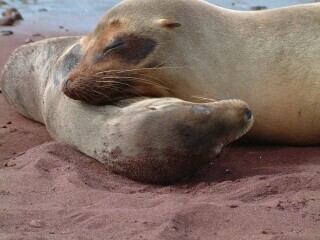 The Spanish name for the sea lion is "lobo de mar" or sea wolf. So which are they more like? Feline or canine? The Galapagos Fur Seals are more secretive than the omnipresent Sea Lions, probably because they were hunted to near extinction in the past centuries. Not technically seals, they are in fact members of the same family as the Galapagos Sea Lion, having both visible ears and use of their front flippers for swimming. Their Latin name, arctocephalus galapagoensis comes from their bear-like heads. (Very endearing!) The fur seals are found only on the islands surrounded by the coldest waters as they are originally inhabitants of the Southern Ocean. This mother and pup were having quite a vocal argument as we approached in the panga (dinghy). The pup was determined to go for a swim, whether to find some breakfast, or to see us, it's not clear. It was clear that the mother was NOT going to let the pup leave the rocky cave. Fur Seals are suited to the colder waters, having two hairs in each follicle, whereas the Sea Lions have only one, and thus are more suited to their California origins, and warmer water. White-tipped sharks are endemic to the Galapagos. At Bartolome Island they circle for hours in schools of 10 to 20 individuals, feeding in the rich cold water. 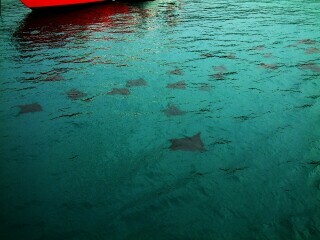 They are non-aggressive, though it can be quite a shock to meet a 6 foot shark suddenly while snorkeling. The Galapagos Islands owe their name to these lumbering land tortoises. When the Spanish explorers arrived in the islands in the 16th century they saw a likeness between the arched shells of the tortoises and the horse saddles of Spain, called "galapagos." Galapagos tortoises were hunted to near extinction or taken alive as meat on pirate and explorer ships for many centuries. Now, they live in the wild on only a few of the islands. When the National Park was formed, captured tortoises were returned from many countries and are now kept isolated at the Darwin Center on Santa Cruz Island. Due to introduced animals such as rats, baby tortoises are unlikely to survive to adulthood in the wild. To help insure the survival of the many sub species, there are tortoise breeding programs on Santa Cruz, San Cristobal, and Isabela islands where visitors can see the incubation process and the young tortoises which are being raised for release into the wild. Experts can tell which island a tortoise comes from by the shape of its shell. 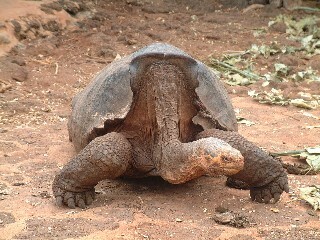 For instance, the high shell opening on this one is characteristic of tortoises living on islands with high vegetation. The native Rice Rat of the Galapagos (which came long ago from South America) holds the world record for sea crossings for terrestrial mammals! Although there were once seven distinct species in the islands, now only two or perhaps three survive. Once ships began coming to the archipelago and their black rats escaped to shore, the native rats declined rapidly. 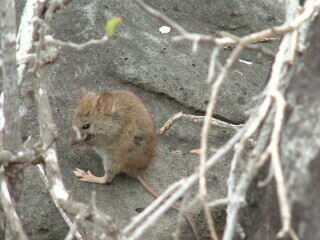 This fearless little shrub-climbing rat is on Santa Fe island, where the black rats have not yet threatened the rice rats.